MLNP: MANIC w/ SF 49ers bartenders tonight!! 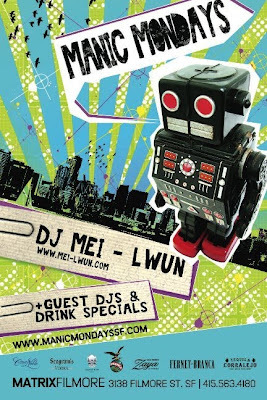 The craziest weekly party on the planet MANIC MONDAYS welcomes Dj HellaMiles along side Dj Mei-Lwun for another installment insanity on the decks and the dance floor. Also this week our annual celebrity servers party where your San Francisco 49ers will be serving drinks. Cocktails will be served by your favorite 49ers players, including Takeo Spikes, Patrick Willis, Joe Staley,Parys Haralson, and more. All funds raised will go to Breast Cancer research and education (Northern California Cancer Center). Never a cover & drink special on Fernet and Corralejos for your liberal libations make MANIC the perfect Monday night shindig! !